Lucy has a home! 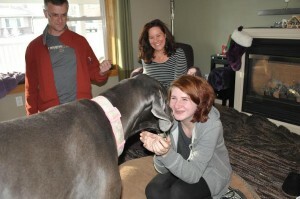 - Rocky Mountain Great Dane Rescue, Inc.
Sweet & precious Lucy has meandered her way right into the hearts of Rachel and Bill’s hearts. Lucy will share her new forever home with 1 cat and 3 teenage sons…Best part of the deal is, Lucy will rarely ever be alone! her new parents work from home, so she will always have her humans by her side. Congratulations Lucy!